The Contemporary Drafting Set provides a complete work center at a great price. 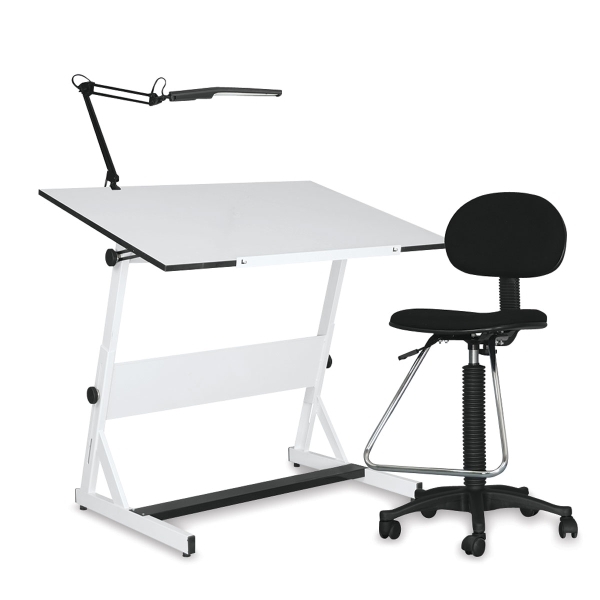 It includes a drafting desk, a drafting chair, and an adjustable lamp. The white melamine top of the drafting desk measures 42"W × 30"D and tilts to a full 90° angle. Its base includes a built-in storage shelf and four levelers to accommodate uneven floors. Two locking adjustment knobs lend stability and leverage. A hideaway pencil ledge is handy for keeping writing instruments at your fingertips. The height of the comfortably padded drafting chair is fully adjustable via a hydraulic lift mechanism. The black metal clamp lamp offers bright illumination and adjusts at two points for the perfect angle every time.